Even though the look of a guitar is a big factor in one’s desire to play this instrument, there are other things to consider when choosing a guitar. Here are some things to keep in mind when looking for the right guitar. First some history: the electric guitar first appeared in the 1930s out of a need to solve some of the problems that blues and jazz guitarists were having at the time. Guitarists were often part of big bands and other large ensembles often containing drums, piano, brass, and even strings, so it was, of course, quite difficult for them to make themselves heard, and, often, even to hear themselves! They were, therefore, looking for a way to play louder and that’s how the idea of the amplifier came along, thanks also to the progress made in pickups. It was Rickenbacker that made the first electric guitar prototypes, which used tungsten pickups. They were on the right track, but feedback was still a major issue due to the fact that all guitars were hollow bodied at the time. It was in the 40s that Les Paul, working at the time with Epiphone guitars, came up with the idea of building a guitar that didn’t have a sound chamber, so as to avoid feedback issues: The solid body was born! It was a radical departure from traditional hollow body guitars, but henceforth the electric guitar was now a feasible idea. It was through the work of Leo Fender that the electric guitar really came into its own. In 1950, Leo put his finishing touches on the Telecaster followed in 1954 by the Stratocaster model. Meantime, Gibson came out with its famous Les Paul model. In just 4 years the major principles of electric guitar building were established; principles that are still used to this day. In general the choice of shapes and finishes for an electric guitar are much larger than for acoustic guitars. In the last 60 years, manufacturers have experimented with just about all possible shapes and sizes, so its basically down to the player’s personal taste. There are, however, certain classic shapes (like the Fender Stratocaster and the Gibson Les Paul) and their countless spin offs and variants. Putting taste aside, what really makes the difference between electric guitars is what they are made of and whether they be solid or hollow. This category consists for the most part of jazz and retro-looking guitars, and are usually grouped into either hollow or semi-hollow. The thinner they are, the less acoustic sound they produce, and therefore the less likely they are to feedback. One must also keep in mind that a guitar can have a hollow/ semi-hollow body without there being any visible holes in the sound board (BB King’s famous Gibson Lucille guitar is a prime example). Semi-Hollow guitars have a solid center block, that runs the length and depth of the body, which stabilizes the soundboard, making the guitar less prone to feedback (a consistent problem plaguing all hollow body guitars). Some electric guitars have one or more chambers (sound boxes) carved into the body, which can be visible or not from the outside. There are, of course, a thousand subjective opinions about how these chambers effect the sound of an otherwise solid body guitar which can range from "woodier" to "more airy", but, ultimately, one must forge their own opinion. As with acoustic guitars, solid wood is the best way to go since it has superior resonance and ages much better, but also of course more expensive. Contrary to what some novices might say, the body of the guitar has a fundamental effect on its sound. In fact, (to simplify) the pickups only amplify the vibration of the strings, and this vibration depends largely on the resonance of the string-body-neck-hardware ensemble. As a general rule, the heavier the wood, the more it sustains, but the sound will be less bright. This heavy wood assures ample sustain and a warm tone. On the other hand, the signal will have the tendency to be less bright, especially when using distortion. Typical Examples: Gibson LP, Gibson SG, Lag Roxanne. For entry-level guitars, mahogany is replaced by less expensive varieties. This wood has a density and response similar to mahogany, but less warm and slightly brighter. It provides well balanced response across the sonic spectrum, and though not very dense it provides resonant tone with excellent sustain. It therefore comes as no surprise that fender uses alder for its famous Stratocaster model. 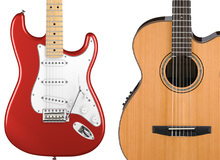 Typical Examples: Fender Stratocaster, Fender Telecaster. Existing in many varieties (curly, birdseye, fiddle back…) and different prices, this hard wood (with a density of 540 to 700 kg/m3 ) tends have a bright and penetrating sound . It is often used for soundboards which are in turn placed on mahogany bodies to give the sound of the guitar more brilliance and brightness as, for instance, on the Gibson Les Paul. This wood is heavier than Alder (density of 580 to 690kg/m3 ), and is favored for giving ample sustain and having a bright and penetrating sound. It is therefore often used for the body of the guitar. Swamp ash, a variety of ash, gives us the best of both worlds: great sustain , and it's very light owing to its very big open pores. Of course it's more expensive. Typical examples: Fender Telecaster, Yamaha signature Mike Stern. As for acoustic guitars, there are two main woods for guitar necks. Mahogany necks (rounder and more mediums), Maple necks (brighter). For the fingerboard/fretboard, a dense and hard wood is favored. The choices are the same as for acoustic guitars. Ebony : a very dark and hard wood that can be found on high-level guitars. This very dense wood (1000 to 1200 kg/m3) gives precise intonation and reinforces the neck’s rigidity. Rosewood : a rather hard wood(850 kg/m3) that gives a softer, less bright sound, but ideal for certain styles (blues, etc...). Brazilian Rosewood has become a scarce commodity and therefore is quite expensive, so indian rosewood is now often used in its place. Brazilian rosewood has the reputation of having more clarity in lows and a bell-like tone in the trebles. Maple : This wood has a drier sound than either rosewood or ebony and is mainly found on maple necks. On certain maple necks, there isn't even a fingerboard. There’s no question: sealed enclosures with permanent lubrication are best. They insure simple and precise tuning..
Bridges can be fixed (hard tail), like on a Gibson Les Paul or Fender Telecaster, but they can also be part of a tremolo/vibrato setup (a lever attached to the bridge which can temporarily slacken the strings and thereby change the pitch). Bigsby tremolos, which date from the 40s, change the pitch around 1 to 2 half-steps. They can be found on Gretsch and Gibson hollow bodied guitars, amongst others, and are the vibrato of choice for many Country, Rockabilly, and Rock’n’roll players. If matched with a good bridge that’s correctly calibrated, it will usually stay in tune. A Fender (synchronized) tremolo is partly built under the bridge and offers a greater pitch change thanks to a bevel carved into the body allowing for more leverage. The problem with this type of vibrato is that the guitar has a tendency to go out of tune. The Floyd Rose tremolo( or locking tremolo) , popularized by Eddie Van Halen through such works as Eruption, evolved out of the Fender tremolo. The idea was to make a tremolo that would allow guitarists to drastically change the pitch of the strings without having tuning problems. In order to achieve this, it uses two string blocking devices, one at the bridge and the other at the nut. While this setup works very well, it is nonetheless quite awkward for changing strings, so beginners should be advised. Single coil: Historically, they were the first pickups invented for guitar. Though very sensitive to electrostatic noises, these pickups have nevertheless played a crucial role in the history of rock-n-roll, funk and soul. They have a sound range that goes from a dark and fat midrange found in P-90s to the bright and clear Fender Stratocaster sound. Thus, there is a distinction made between standard single-coil pickups and P-90 type single-coils, which are warmer and more powerful (Typical Examples : Fender Telecaster, Fender Stratocaster, Gibson LP Junior). Humbuckers can be split. In this case, only one of the two coils is used, in order to get a sound very similar to a single coil. Note that pickups can be paired, in series or parallel, in phase or out of phase, depending on the guitar's built in circuitry. Thus one can create additional sound combinations and possibilities. In recent years, bridges that feature piezo-electric pickups (those found on acoustic-electric guitars) have become more common. These can be combined with the standard pickups on the guitar. A final note: the presence of a truss-rod is indispensable for the fine tuning of your instrument, such as when changing the string gauge.